Available to Enterprise customers, the Q&A experience allows learners to post questions and answers within their organization. Q&A is a tool that enables you and your peers to learn collaboratively. Have a question and don't know who to go for help? Ask it on Q&A and your question matches with peers in your organization who have the right expertise to help. Note: All Q&A data belongs to the Enterprise plan organization. Learners who leave the plan cannot take their questions or answers with them. If a learners leaves your plan, their questions and answers will still show for people still on the plan. A. Ask a question: Used for creating a question for your peers to answer. All questions are private to your organization. B. Edit preferences: Used for selecting your Knowledge Areas. Before using Q&A, we recommend selecting your preferred knowledge areas. This allows you to get email and in-app notifications when a peer asks a question in your selected knowledge areas. C. Filter options: Filter all available questions and answers by searching, using the knowledge match toggle, or by topic. Search by peer or any question or answer in your organization. D. Solved questions: All solved questions show here. This allows for quick reference to any answered question in your organization. E. Unsolved questions: All new questions show here and allow for anyone in the organization to answer. Questions show from newest to oldest. Tip: The Get started area is a great experience to learn about and begin using Q&A. Before getting started, we recommend selecting your preferred knowledge areas. Knowledge areas represent skills and topics you feel most confident in. Use the Edit Preferences button to select your knowledge areas. When a peer asks a question in your knowledge area, you'll receive an email and in-app notification. You may change your knowledge areas at any time. Begin by clicking the Ask a question button. By default, new questions show in the Unsolved questions area. Anyone in your organization with a license can ask a question. Along with asking a question, you can edit, delete, or mark a question as solved. Questions allow for markdown and a preview option ensuring you've formatted the question the way you'd like. You may select up to 3 knowledge areas per question. 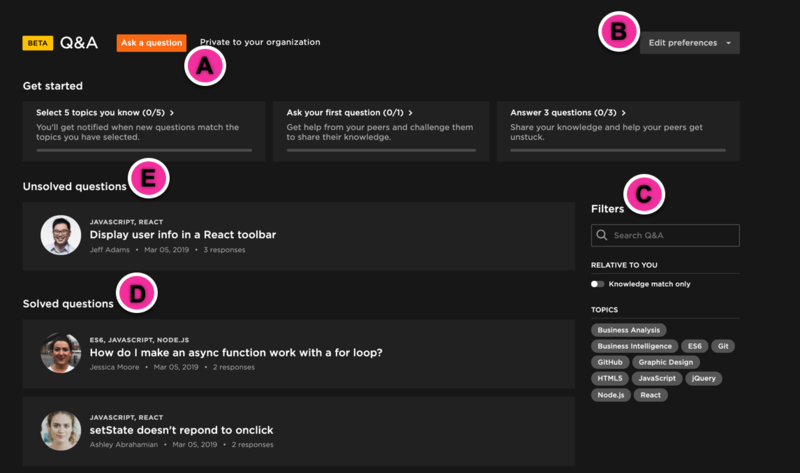 Your question matches up with peers based on the knowledge areas you select. To edit a question, locate the Edit button in the question you asked. You cannot undo your edit, but you can edit as many times as you'd like. To delete your question, locate the Delete button in the question you asked. Once deleted, your question any answers are no longer viewable. There is no recovery of deleted questions and answers. Plan admins can delete any question on the plan. Marking a question as solved indicated you've found a solution. Your question moves to the Solved questions area for future reference. Do this using the Mark solved button within your question. All answers are private to your organization. Anyone in your organization with a license can answer a question. Along with answering a question, you can edit, delete, or mark an answer as helpful. To answer a question, find a question in the Unsolved questions area or answer a question you're matched to. Use the knowledge match toggle to filter to questions in your knowledge areas. Your peer receives an email and in-app notification that you've answered. To edit your answer, locate the pencil icon in your answer. You cannot undo your edit, but you can edit as many times as you'd like. To delete your answer, locate the trash bin icon in your answer. Once deleted, your answer is no longer viewable and cannot be undone. A deletion message shows to peers who contributed to that question. Plan admins can delete any answer on the plan. Below is a list of email and in-app notifications associated with Q&A. To download a CSV report for all Q&A questions and answers on your plan, go to your Dashboard and select "Q&A" from the Download report dropdown menu.